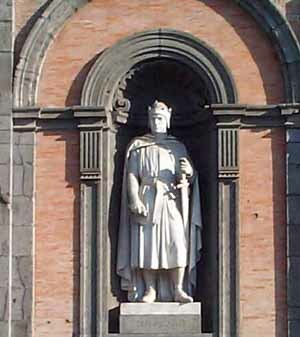 Charles of Anjou arrived victorious in Naples in 1266 to begin the two centuries of Angevin rule of southern Italy, which established Naples as a European capital and continued the tradition of the southern monarchy whilst the rest of Italy was fragmenting into city communes and states. Having defeated and killed the Swabian ruler Manfred in battle, Charles quickly began to secure his position by imprisoning all supporters of the imperial designs of the Teutons. There remained, though, one obstacle to his safe establishment on the throne of Naples and Sicily: Corradino. This legal heir to Frederick II lived out of harm's way in Germany but within a year, Corradino, still only fourteen years old, was marching through Italy to claim his birthright. Their armies met in decisive battle at Tagliacozzo, on the border between Abruzzo and Lazio and a defeated Corradino, attempting to flee Italy, was taken prisoner in Terracina and brought to Naples. Charles needed to establish his kingship and knew that whilst the young pretender lived, he would be a rallying point for the pro-imperial Ghibelline party. The young Corradino was, therefore, unceremoniously beheaded in Piazza del Mercato in Naples. It was an act which shook the mediaeval world but it was politically decisive and undertaken in the knowledge that no opposition would be forthcoming from the Church, which had, after all, invited Charles into Italy precisely to remove the Swabian presence. Now able to concentrate on his kingdom, Charles I transferred the capital from Palermo to Naples. This allowed him to be closer to the center of his interests, which included being a Roman Senator, lands in Provence and a desire to expand to the East. The decision conferred great prestige on Naples and placed it on equal footing with the other major European capitals in terms of trade and as a diplomatic centre. This prestige would be matched by the monuments which the Angevin Kings and Queens bestowed upon the city. On the negative side, the Neapolitans discovered that it was expensive to maintain a king and his court, especially as large sections of the population—principally the church and the wealthy — were exempt from taxation. The brunt of the cost had to be born by the less-wealthy sections. Added to this was the predilection, shared by the first three kings in the line, to amass wealth and debts. Coming to the end of his life, Charles found that, other than having to negotiate for the release of his son, many of his southern territories were rallying around the Aragonese banner. Tired and disenchanted, he passed away in 1285 having declared his nephew, Charles Martello, heir in the absence of Charles. Peter of Aragon also died soon thereafter. Charles II was finally released in 1289 but another six years were to pass before he was finally able to obtain a truce with the Aragonese. As a result of this truce the Aragonese became recognizably allied to the Angevins and there followed a period of pacts, negotiations and inter-family marriages, all aimed at resolving the problem of Sicily. Robert, heir and third born son of Charles II (the first died and the second, Ludwig, took the cloth and was eventually canonized) and his sister were married to Sancia and Sancio, the children of King James of Sicily. With the two royal houses now linked by marriage, Charles II was able to consider that a long and complicated period of struggle had ended and felt free to pay a long-postponed visit to his territories in Provence. On his return to Naples in 1308, he died and was succeeded by Robert. Crowned King of Sicily and Naples in August, 1310, Robert proved to be the most highly thought of amongst the Angevin rulers. A dignified and coherent king, he led the pro-church Guelph party, with a religious zeal that often verged upon bigotry (in private he was often less than saintly, occasionally needing calling to order for his womanizing), in a period when the Ghibellin party was pressurizing for a return of an emperor. Many of their Ghibellin hopes rested on Arrigio VII of Luxemburg, who was indeed crowned emperor and then quickly declared himself an ally of Frederick of Sicily. Inclement weather, in the form of flooding and Clement V, in the form of an excommunication, prevented Arrigio from immediately attacking Naples. The threat was finally removed by Arrigio's death in August, 1313. King Robert's role as protector reaped him great prestige and riches in the form of subsidies from Florence and other Guelph communes. Robert and, consequently, Naples had opportunity to develop in status and wealth. In the course of his reign he also became indebted to some of the most illustrious Florentine bankers, repaying them in kind with import permits, and mortgage rights on income from taxes and import duties. Funds were made available for an invasion of Sicily but the landing carried out in 1314 failed so abysmally that several years were to pass before anyone seriously thought of another attempt, especially as Robert had to concern himself with further troubles from the north, this time in the form of Ludwig of Bavaria, a new manifestation of the Ghibellin party's determination to have a new Holy Roman Emperor. By the time of his death at the beginning of 1343, Robert had established himself a superb reputation. "The wise King Robert", "the new Solomon", "the peace-maker of Italy" may have failed to live up to the hopes of those who thought he might achieve the unification of Italy, but he had built largely on those advantages established by the first two Angevin Kings. Naples was now beginning to look like a mediaeval capital due to the splendid buildings and monuments bestowed by these monarchs, who freely availed themselves of craftsmen and artists from the great artistic centres of mediaeval Italy. Many traders and craftsmen from other Italian states and overseas had also set up operations in and around the capital city, adding to its vitality. Within the reigns of these three kings, building had begun or was nearing completion on some of Naples most important monuments, including Maschio Angioino (greatly modified in mid-15th century), the Church of Saint Eligio, The Duomo, San Lorenzo, Santa Chiara (location of Robert's magnificent funeral monument) and San Martino. Indeed, much of the splendour of medieval (and modern) Naples stems from the first part of the Angevin rule, and although kings and queens of the line were to rule until the end of the century, it was of these kings, and Robert in particular, that writers and historians would continue to write longingly about for the next century — harking back to the days of Robert the Wise, when Petrach was presenting himself before the King, and Boccaccio was wandering around the Court, spurning his native Florence, "devoured by innumerable cares" for the inspiration of "happy, peaceful, generous and magnificent Naples".